Gorgeous, isn't it. Very elegant and shapely. Shanghai Tower, eponymously named, just topped out a few days ago in China and now is the tallest building in Asia. At 2,073ft (632 metre) structure, Shanghai Tower stands in the city’s Lujiazui Finance and Trade Zone, beside the Jin Mao Tower and Shanghai World Financial Center. It is the tallest building in Asia and the second-tallest building in the world, after 2,716.5ft-tall Burj Khalifa. An undulating, curving tower, this will become the tallest of many planned curved or spiraling skyscrapers in the works around the world (see previous blog entries: http://markgsmusings.blogspot.com/2009/12/i-want-to-live-in-this-cool-building.html and http://markgsmusings.blogspot.com/2009/08/those-dubai-dudes-are-really-amazing.html). 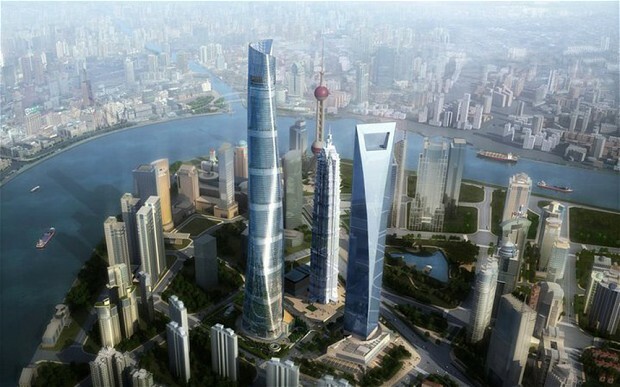 Shanghai Tower is the creation of US-based architectural firm Gensler, whose other developments include Houston’s Hess Tower and Farmers Field in Los Angeles. The 121-story building will include offices, numerous entertainment venues, retail units, a conference centre, cultural attractions and a luxury hotel. The building will be joined by a number of other Chinese record breakers in time. The Council on Tall Buildings and Urban Habitat last year found that nine of the 20 tallest buildings currently under construction worldwide were being built in China. Last month it was announced that construction of what would be the world’s tallest building (see earlier blog: http://markgsmusings.blogspot.com/2013/07/chinas-proposed-new-tallest-building-in.html) had begun in Changsha in China’s Hunan province. Construction on the building was begun in 2008. That means that the construction of the future tallest building in the world that I discussed a couple of days ago (click here: http://markgsmusings.blogspot.com/2013/07/chinas-proposed-new-tallest-building-in.html) is all the more remarkable, because, assuming it is built, as proposed, would be completed in just months. This really interesting photo study of the construction process is fascinating. Particularly the photo which shows the framework built to create the exterior shape.